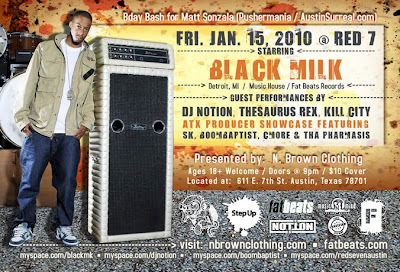 From the it's your birthday department... Black Milk @ Red 7 tonight, Jan 15th! Come out and celebrate my boi Matt Sonzala's Birthday! n 2004, he formed B.R. Gunna, with Young RJ, and Fat Ray, and together they released Dirty District: Vol. 2, a follow up to a compilation released in 2001 by Slum Village, which he had contributed production to. Black Milk released a solo album, Sound of the City, Vol. 1, the following year and in 2006 he signed a record contract with Fat Beats Records (Fat Beats is currently distributed by Koch Entertainment, the largest independent distributor in the U.S.). In the fall of 2006, he released an EP, entitled Broken Wax. March 13, 2007 he released a second album, Popular Demand. In addition to Slum Village, Black Milk has worked with the likes of J Dilla, Elzhi, Phat Kat, Frank-N-Dank, Lloyd Banks, Canibus, and Pharoahe Monch, and handled most of the production on T3's Olio mixtape of 2006. In the Winter of 2007/2008 Black Milk paired with Aftermath recording artist Bishop Lamont to release a mixtape entitled Caltroit, which was nominated for Best Hip Hop Mixtape at Justo's Mixtape Awards.